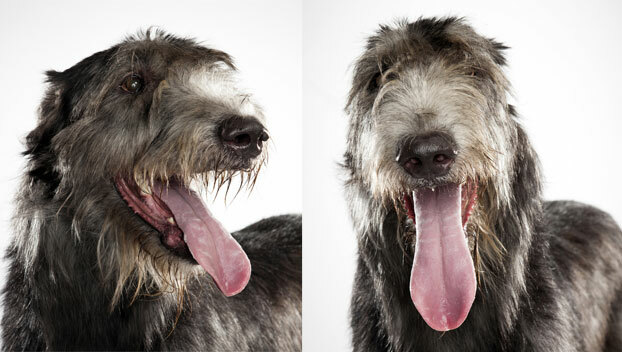 Is the Irish Wolfhound right for you? Find your perfect match now! There's more to love with an Irish Wolfhound! These giants among dogs can be almost seven feet tall when they're standing on their hind legs. Enormous, shaggy, and striking, a Wolfhound puppy grows like crazy — they can gain a pound every day, and grow to almost one hundred pounds by the time they reach six months old. 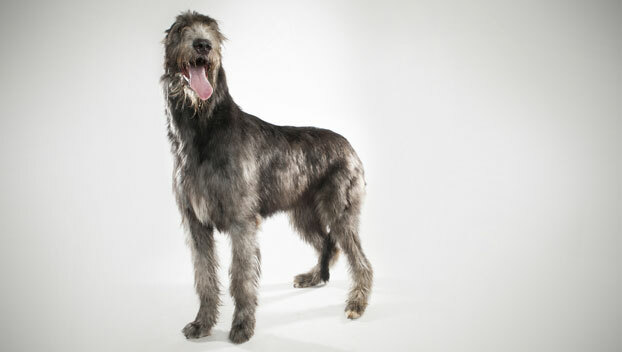 As a breed, the Irish Wolfhound is the world's tallest dog. It's no wonder an adult Wolfhound can eat about three pounds of food every day. 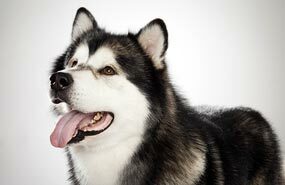 This is an ancient breed that might date all the way back to the third century BCE. Irish Wolfhounds made the history books in Julius Caesar's description of the Gallic wars. Back in the day, these dogs were given as royal gifts and used to hunt boar, elk, and wolves. While some are still used for hunting, these days an Irish Wolfhound is more likely to be hogging your couch than hunting down boar. Originally from Ireland, this large-sized and medium-energy breed can grow to between 105-120 pounds and lives an average of 6-8 years. The breed is recognized by the American Kennel Club and classified as a member of the Hound group. 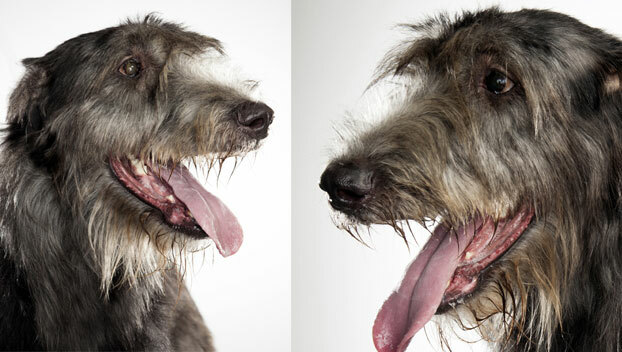 WHAT IS AN IRISH WOLFHOUND'S PERSONALITY LIKE? WHAT IS IRISH WOLFHOUND BEHAVIOR LIKE? They make great house dogs because they are not particularly active. They'll only need room to run and stretch their legs. A large well-fenced backyard should do the trick! They are unabashed counter surfers, so think twice before leaving that steak out where it can be reached. A bored or lonely Irish Wolfhound can be destructive — and given their size, they can do a lot of damage. Be sure you give your furry friend plenty of company and exercise. HOW EASY IS IT TO TRAIN AN IRISH WOLFHOUND? Irish Wolfhounds respond well to training. Start early and be patient and consistent with your pup. Their prey drive means that they shouldn't play off leash outside well-fenced or rural areas. HOW MUCH DO IRISH WOLFHOUNDS SHED AND WHAT ARE THEIR GROOMING NEEDS? 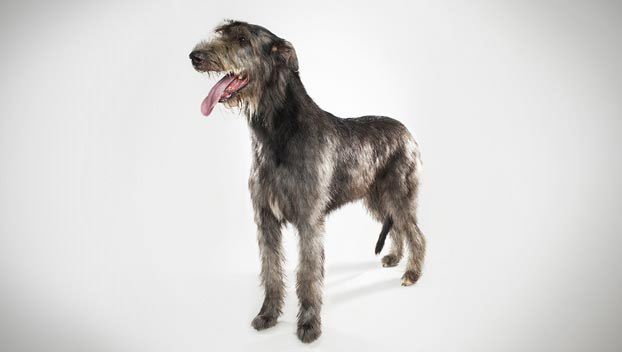 An Irish Wolfhound's coat is wiry, scraggly, and rough. These dogs are fairly easy keepers: they need weekly brushing and hand stripping every six months. They are minimal shedders. WHAT HEALTH PROBLEMS DO IRISH WOLFHOUNDS HAVE? Unfortunately, Irish Wolfhounds have short lifespans, and they're prone to heart disease, bone cancer, and bloat. Bloat is a condition that requires immediate attention from your veterinarian. Familiarize yourself with the symptoms of gastric dilatation volvulus (GDV) and contact your vet at once if you suspect your dog might be suffering from this ailment. Feeding your baby Irish Wolfhound a growth food for large-breed puppies will slow their rate of growth but not diminish their adult stature which may help prevent or reduce the impact of adult-onset hip dysplasia. Another thing to keep in mind is that these dogs are big and bony. Lying on hard surfaces can hurt an Irish Wolfhound's joints; they can form calluses on their pressure points if they don't have soft spots to lie down on. If you want to welcome an Irish Wolfhound into your home, make sure she has plenty of cushiony surfaces to lie on—or that you don't mind sharing your couch, chair, or bed with this hairy colossus! ARE IRISH WOLFHOUNDS GOOD FOR PEOPLE WITH ALLERGIES? The American Kennel Club doesn't list Irish Wolfhounds among its breeds recommended for allergy sufferers. You can reduce your furry friend's impact on your allergies with frequent baths and brushings to reduce loose hairs and allergy-aggravating proteins in your pet's dander. Use a damp cloth to wipe off your dog after playing outside. Smaller dogs have less surface area, so they produce comparatively less dander than larger breeds — definitely something to keep in mind with a dog as large as an Irish Wolfhound! Remember that no breed is 100% hypoallergenic, and any breed can aggravate allergies. WHAT IS AN IRISH WOLFHOUND'S BEST DAY? Irish Wolfhounds don't ask for much, beyond mountains of food and plenty of space to roam. Lounging on their own cushy beds—or yours, they're not picky—would be the perfect end to an Irish Wolfhound's day. SHOULD I ADOPT AN IRISH WOLFHOUND? Irish Wolfhounds are great in the cold but wilt in hot weather. These dogs are really just too big for apartments and small homes — they need to live with people who can give them plenty of room to run and space to spread out. Did we mention how much they eat? Boarding and vet care for dogs of this size can be costly, too. Keeping this dog happy and healthy requires a serious investment of both time and funds. But if you can afford to give your Irish Wolfhound what she needs, this breed makes a sweet-tempered, lovable family companion. 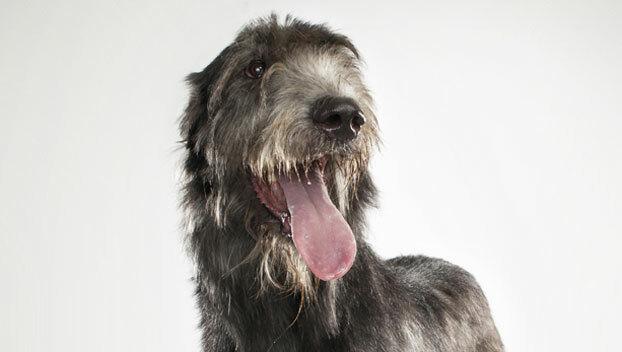 Have you decided that an Irish Wolfhound is the perfect dog for you? Why not be your new best friend's hero and adopt a rescue! Be sure to check out our article on what to expect when you're adopting a dog or cat.